/ CEOs: We gave our board real-time access to our business data and here’s what happened. There’s something about watching a live NBA game that can’t be replicated by just catching the SportsCenter highlights. Seeing the action as it unfolds makes you more invested in the players and care more about the outcome of the game. If business is your sport like it is mine, you can apply that same concept to how you work with your board. Several years ago, I had an idea. I thought that if our entire company had direct access to real-time data about our business, our board should have the same. After all, we were embracing transparency to improve the way we ran our company, so it only made sense, no matter how uncomfortable, to deliver that same transparency to our board. Technology made it completely possible, but the idea was something entirely new. And, to be honest, it was a bit unnerving. Giving the board direct access to real-time data around our entire business—where would that lead? Nobody was doing that. Were we ready? Could we be comfortable with that level of transparency? It took us a while to move from idea to action, but we finally made the leap about a year ago. We knew the board was in our court—and by having the board’s eyes on our business at all times, we’d have even more motivation to quickly fix those things that weren’t yet where they needed to be. The quarter after giving the board access, we started to see some positive impacts. Board members didn’t need a deck the week before the board meeting to review numbers. They had been following the data all quarter long and instead of waiting to give input when the quarter closed, the board had the ability to advise how to pivot, shoot or pass when it mattered most. It was easy for them to make a meaningful impact. Since we no longer needed a significant portion of the board meeting for reviewing numbers, we could now focus our valuable group time collaborating and strategizing on action plans for growth and what to do based on the information they had seen. One board member told us the transparency made him feel more emotionally connected to our business, while another was thrilled he could spontaneously answer questions from his team about our business because the data was always updated and available on his phone. For another board member, access to real-time data has made the end of the quarter feel more like an NBA playoff game. A few days before our last board meeting, I gave him a call. When he picked up the phone, I asked him what he was doing and he told me had just popped some popcorn and opened Domo to watch the month close in real time. True story. 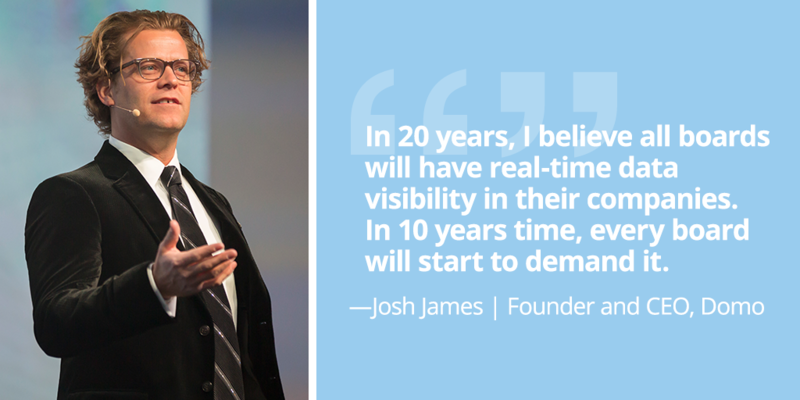 In 20 years, I believe all boards will have real-time data visibility in their companies. In 10 years time, every board will start to demand it. To get the most value from your board of directors, you have to bring them into your “circle of trust” and give them courtside seats to what’s happening in your business. Experience what it’s like to run your business where your stakeholders have complete visibility into your business wins and challenges. It will make you better and transform the way you do business. I guarantee it.